This week has proven to be a big one for Progress Apama at the SIFMA (formerly SIA) show in NYC. As of end of Wednesday – with one day remaining - we can already categorize the event as a big success with lots of visitors to the Apama exhibit at #2117, in the “Grand Ballroom” of the New York Hilton. At times, there's been little room to maneuver, as people have come to hear about and see demonstrations of our recent announcements - including market surveillance (FSA), integration of news in trading strategies (the Dow Jones Elementized News Feed), and the Apama FX Market Aggregation Accelerator. With a number of other demonstrations showcasing the application of Apama's CEP platform to algorithmic trading, it has been a challenge to accommodate all the demonstrations, while we also highlight the capabilities of fellow Progress product line, Sonic, and partners ULLINK and Microsoft, who are also demonstrating with us. One of the areas we sought to illustrate at this year's event is the ever-expanding Apama ecosystem of customers and partners. We’ve done this via a mural that is being created live by a local NY artist during the show. 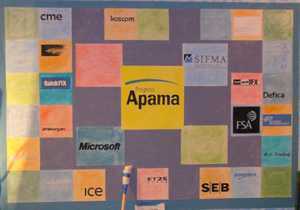 What began as a blank wall is evolving into a colorful and eye catching array of logos from many of Apama's customers and partners. The mural is still a work–in-progress, but we thought we'd provide an interim view, with a complete one to follow, once it is complete. While a visually interesting, it's also proven an enlightening one as people see the number of organizations who are using Apama or partnering with Apama to deliver sophisticated algorithmic trading solutions.